Product #21543 | SKU TRR | 0.0 (no ratings yet) Thanks for your rating! 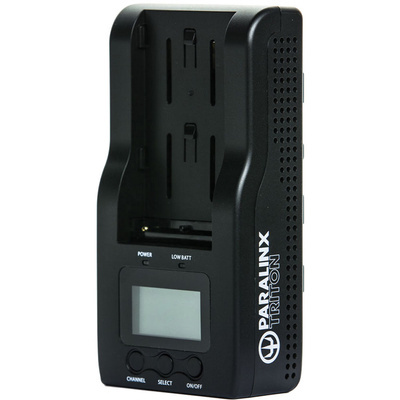 The Paralinx Triton System Wireless Receiver receives wireless video with audio up to 1080p60 from an optional Triton transmitter from up to 140 m away with a delay of less than 1 ms. You can link an unlimited number of Triton receivers to one transmitter, however Triton receivers only work with optional Triton transmitters. The system supports 128-bit AES encryption to protect the security of your footage. The receiver features an HDMI output, and it incorporates an NP-F type battery plate with power pass through capability. The system operates on the licence-free 5 GHz frequency band with 8 available channels. It utilises 1/4"-20 mounting and features an LCD screen that displays signal strength, remaining battery power, and channel selection. The system supports linking of an unlimited number of optional Triton receivers to one Triton transmitter. Linking is accomplished with the push of a button as long as the receiver is set to the same channel as the transmitter. Please note that the Triton receivers only work with Triton transmitters. The receiver incorporates an NP-F type battery plate that features a power pass through that allows you to mount the receiver to a monitor with an NP-F battery plate, and power both the receiver and the monitor via a single NP-F type battery.